South Orange, New Jersey: More changes are coming to Valley Street in South Orange, as an auto repair business prepares to move and a new apartment complex is getting ready to open. 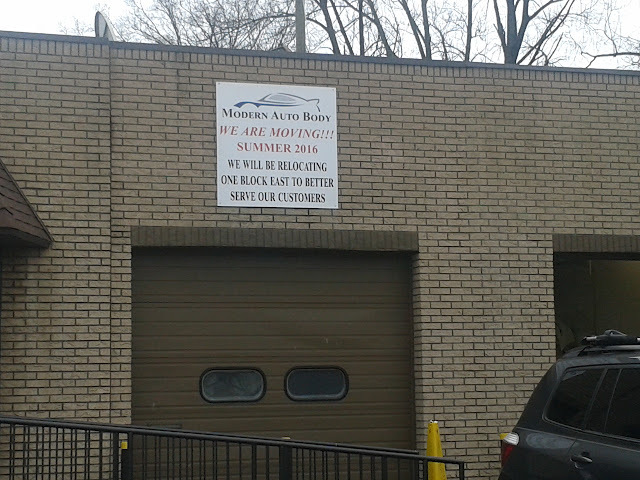 Modern Auto Body will relocate this summer from 410 Valley Street to 343 Valley Street, between Roland Avenue and Lackawanna Place. The space was previously occupied by South Orange Imported Cars and Subaru Parts and Service, which closed in 2015. The current Modern Auto Body facility has been listed for lease. In addition, the Third and Valley complex, which will contain retail space, 215 apartments, and a parking garage, is nearly complete. A left turn lane on Third Street into the new parking garage for residents and commuters was recently installed.